Bollywood has made a number of anti-Pakistan movies which has broken all the records of abhorrence. Indian movies against Pakistan like Uri, Raazi, and others have only made the situation between two countries worse and has developed hatred amongst people. However, Bollywood is now all geared up to come up another anti-Pakistan film based on the Indo-Pak war of 1971. 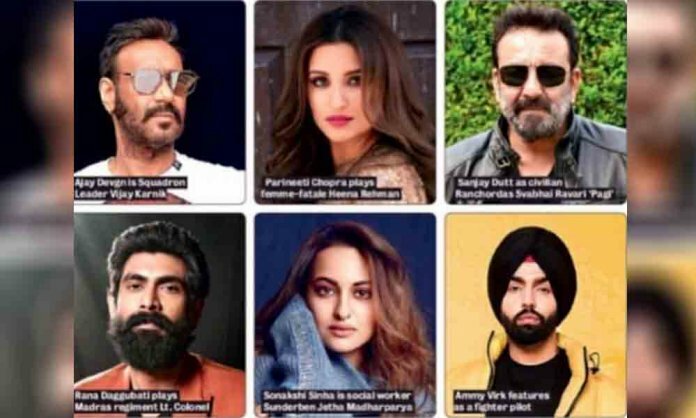 It has been revealed that famous actors like Ajay Devgan, Sanjay Dutt, and Parineeti Chopra have been roped in to join the cast of the upcoming film titled Bhuj: The Pride of India. The film will also star Sonakshi Sinha, Rana Daggubati and Ammy Virk. The most special true story ever. It has been said that Ajay Devgan will be playing the role of Indian Squadron Leader Vijay Karnik in the film who was in charge of the Bhuj airbase during the 1971 war. On the other hand, Parineeti plays the role of Heena Rehman and Sonakshi will be seen as Sunderben Jetha Madharparya. Next articleUshna Shah Sends Love To Iqra Aziz And Here Is Why!